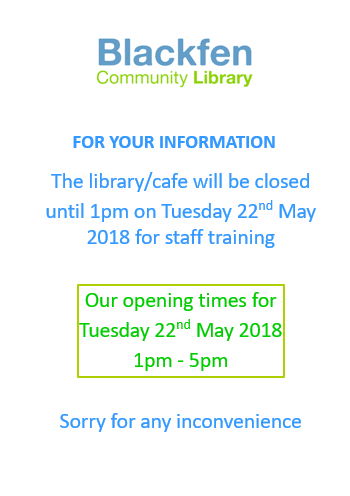 All of our library staff and volunteers will be taking part in an away day on the morning of Tuesday 22nd May from 9am to 1pm, so the library will have shorter opening hours of 1pm to 5pm that day. This means that we won’t be holding our usual Sparkle Babies session, but we will be back again as usual on 29th May. Thanks for your understanding, and apologies for any inconvenience caused.